This is an exceptional deal, offering an extremely capable gaming laptop with a glorious screen to boot. The prices of gaming laptops are always breathtaking at first glance, so when a great deal comes around its worth taking notice. And while they'll often still be large price tags, the value of some deals is indisputable. 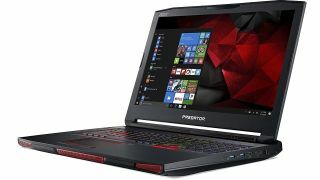 Step forward this deal from Box for UK gamers: get a highly specced up Acer Predator laptop for almost half its £3,000-list price. If you've been holding off on upgrading to a better gaming laptop or fancy having the portable convenience teamed with mega power, then this might be the time to strike. The laptop has some pretty beastly specs and should keep you playing the latest and greatest for a good old while. Sporting a 1080 8GB graphics card, 16GB of RAM, an i7-7820HK processor and a 512GB SSD teamed with a 1TB hard drive, and you've got the basis for a quality machine—which this is. Top those solid components and specs off with a G-Sync enabled, 17.3-inch IPS 4K (yes, 4K) display and you've got a seriously capable laptop capable of presenting you with some of the best pictures going in games. It's a big investment but its a relative steal and the value does add up.